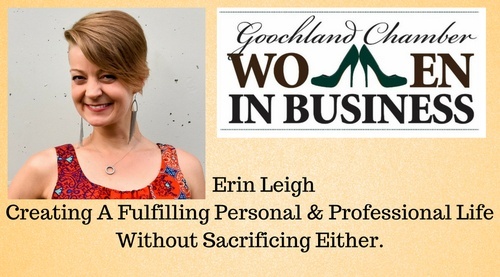 Erin Leigh is our presentor this month. She is going to talk to us about Creating a Fulfillling Personal & Professional Life WITHOUT Sacrificing Either. Through The Choice Life, Erin supports entrepreneurs who are passionate about their business ventrues but who struggle with work-life balance. She coaches clients to increase self-awareness so they can recognize and change their "choice habits." Erin believes our lives are shaped by our micro-decisions - those tiny choices we make throughout our days and she guides her clients to choose differently as they embrace work-life fusion - not work-life balance. Through theNeatNiche Erin works with clients to realease old, outdated stuff (and habits that lead to accumulation), her organizers create space for their clients to embrace the vibrant and fulfilling lifestyle they crave. While her team focuses on residential services for downsizing Boomers, Gen-Xers who are moving homes, and both Gen-Xers and Millenials frustrated by life and stuff, Erin focuses on serving small businesses and their teams through efficiency and productivity consulting. ​You will purchase you lunch via the Cafe Market located right outside the Timber Room.